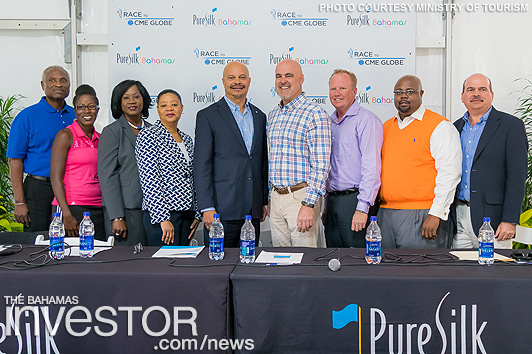 NASSAU, Bahamas, January 2017 (GLOBE NEWSWIRE) — Nearly 700 visitors have descended on Nassau, Bahamas for the fifth annual Pure Silk Bahamas LPGA Classic. The tournament takes place January 26 through 29 with free admission and parking. One hundred and eight golfers from around world are teeing off at the prestigious and gorgeous One and Only Ocean Club Golf Course for the classic on Paradise Island, Bahamas. Players from the United States, Canada, Australia, Singapore, Thailand and other parts of the world are vying for $1.4 million in prize money with the winner walking away with $210,000. “It’s a great event for The Bahamas. You have 108 professional players here. They’ve traveled with their friends, family, caddies. We also have the team from the Golf Channel. So, we are looking at around 600 to 700 people who came down for this event. Then you have media coverage, it’s on television for three days this week for three hours a day. It’s great publicity. Players from all over the world here, the winner last year was from Thailand. We are getting coverage in those markets as well,” Bahamas Ministry of Tourism Deputy Director General, Ellison “Tommy” Thompson said. Thompson said the golf classic, featured in January for the past five years, has been a boon for hotels. “For the Ministry of Tourism, for The Bahamas, if we put heads in beds and get good publicity at the same time, that’s a win-win,” he said. Jeff Raedle, tournament director and principal of Global Golf Management, said he is looking forward to a “phenomenal event”. “We start getting calls before Christmas about, ‘Hey let’s get down there; what are the new plans; what are the activities; what’s going on?’ They are jacked. It’s one of their favorites. The folks from the Golf Channel love, absolutely love, coming down here to cover this tournament. We are pleased that everyone is back here for the fifth year,” Raedle said. In addition to the tournament, there are several other activities featured during the classic including the RBC Junior Clinic. The Pure Silk Bahamas LPGA Classic is sponsored by 35 different organizations including Aliv Bahamas, Coke Cola, John Bull, Royal Bank and The Tribune just to name a few. Officials also noted that over 400 volunteers are assisting with the event. Baha Mar is still on course for an April 21 2017 soft opening, according to the resort’s president Graeme Davis. Watch an interview with him here. The Inter-American Development Bank (IDB) has approved a $35 million loan designed to improve infrastructure at four airports on the Family Islands.